It’s almost impressive how little space is afforded to passengers of commercial flights. Almost. This is easily one of the most commonly-heard complaints, and while it’s understandable that commercial airlines need to cover their costs by fitting as many passengers onto each flight as possible, being crammed into a tin can like a sardine is never fun. There’s something about flying that brings out the worst in people, and there’s nothing worse than being stuck on the same plane as a rude and entitled passenger. We can’t really blame this one on the airlines though; it’s not as if they can start vetting passengers for politeness, but we wouldn’t blame them if they tried! Contrary to what comedians might say, some airlines actually do serve a fairly decent meal . . . though not many. One economical (and still edible) solution is to buy something before your flight. If you can’t pack a lunch, treat yourself to a big meal before boarding to spare yourself from food that somehow all tastes the exact same. Again, we get that commercial airlines need to save space to generate revenue, but some things you just shouldn’t scrimp on. If you’re unfortunate enough to receive nature’s call on a flight, not only do you need to queue for an eternity to bend yourself into all kinds of positions in the stall, but you’ll also be required to cope with the smell of previous “visitors” and the mass of chemicals needed to deal with them. Remember to go in the airport if you can! Yes, airport security is there for everyone’s benefit, but that doesn’t make it any less annoying. It’s very difficult to make sure everyone travels safely, and there are some huge risks involved, but that doesn’t remove the frustration of two hour lines, rude staff, and being treated like cattle. There are few things as frustrating as hearing a baby start to cry in the seat in front of you when boarding a long flight; there’s at least one on every flight, and they always seem to be in the seat closest to us. We shouldn’t really blame the kids though as they are the parents’ responsibility. Not only is it a nuisance for those trying to unwind on a long flight, but if left unattended, they can be at risk in the event of an emergency. Of course, unexpected events happen, and delays are unavoidable, but that’s little comfort to passengers who risk missing a connecting flight because of a little rain. With big commercial airlines, there’s little you can do other than find ways to amuse yourself, so make sure to charge your phone beforehand. Some frequent flyers can probably recite airline safety speeches better than the flight attendants giving them. Alright, everyone should be aware the safety regulations and everybody has to have a first flight sometime, but it shouldn’t take twenty minutes to let us know where the exits are and how to fasten our seatbelts. Again, this is unavoidable and uncontrollable, and also not something that just happens on commercial flights, but a rattling airplane can still be frightening. Just make sure you stay calm and don’t freak out, as it will only make the situation worse for yourself and those around you if you start to panic. While this is usually from the fault of your fellow travelers, airlines could do a better job of addressing the issue if they can’t eliminate it all together. To be fair, it’s no small feat to get rid of the various scents of a throng of travelers and all their worldly goods, but that doesn’t make the subsequent migraine any easier. The above is just one small part of the inexhaustible list of things to hate about commercial flying. Knowing that there’s so much to be wary of should be motivation enough to travel by private jet when given the option. Not being able to afford your own jet does not disqualify you from private travel. 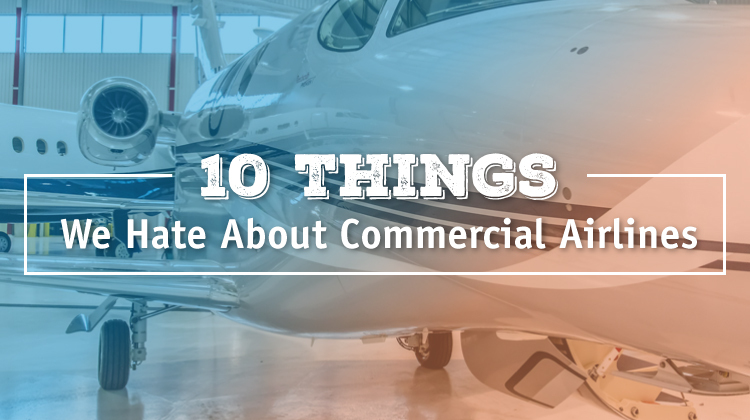 Instead, looking into options such as fractional ownership can save you from obnoxious smells, rude people, unruly children, horrible food, tedious safety speeches, frightening bathrooms, flight delays, cramped seats, and everything else we’ve come to associate with commercial airlines. Do yourself a favor and look into your private jet travel options!